Laura is a violinist studying for her BMus honours degree at the Royal Northern College of Music with Professor Benedict Holland. As a soloist, Laura was a finalist in the RNCM Norman George Scholarship competition, in 2018 and 2016. She was a Prizewinner in the 2018 D’Addario String Competition in the North London Festival. Laura holds an ABRSM Diploma in Violin Performance and advanced to the Strings Category Auditions in the BBC Young Musician of the Year competition, 2014. Her performances with orchestra include Mozart’s Violin Concerto No. 5, Beethoven’s Romance in F, and Bach’s Concerto for two violins. Laura has been selected for masterclasses with Yair Kless, Elena Urioste, Mauricio Fuks and Ning Feng. Laura has held appointments as leader of the RNCM First Year String Orchestra, leader of RNCM Strings Festival Dove Orchestra, co-leader of the RNCM Symphony Orchestra and co-leader of the Cambridge University Musical Society Symphony Orchestra. She was leader of the Hallé Youth Orchestra for two years. As part of her orchestral experience, Laura has worked with esteemed conductors including Sir Mark Elder and Jac van Steen. 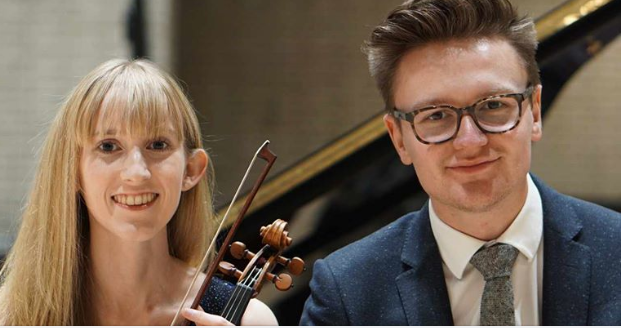 Awarded a Cambridge University Instrumental Award Scheme Scholarship for chamber music, her piano trios have performed across the country, including Emmanuel and Corpus Christi Colleges Cambridge, Wales and Manchester. She has performed in RNCM Spotlight concerts as a member of the Obelisk Piano Trio and Obelisk String Duo. Laura also has a keen interest in music theory. We have a short break until our next concert on 11th May, when the popular Telemann Baroque Quartet will be playing.